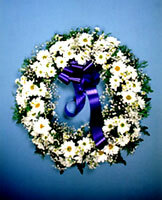 Funerals in Cyprus - Bereavements, Floral Tributes, Wreaths and other gestures of sympathy. It is a difficult time and a difficult subject. We try to get all orders there on time for funerals, wherever they may be in Cyprus, but as it is traditional to bury people very fast here, often the next day, it is not always guaranteed. We will usually take your floral tribute to the church, but can also deliver to the family home if you wish. We do need a phone number of someone who can take delivery. If there has been an accident and you do not know anyone in Cyprus, we can make sure that your tribute is put on the grave. We also offer an anniversary or memorial service where we deliver flowers to the cemetery and arrange them in a vase or urn, or even trim and water plants which may be growing on the grave. The flower tributes below are an indication of what is available from us in Cyprus, Of course they vary with the seasons. These pictures were taken in response to requests to show some idea of the range. This is not hard and fast and is meant as a general guide only. But these are the kinds of flowers you can expect to find in a wreath of floral tributes from Cyprus flowers. We can also do wreaths in the shape of letters which can then make up words. Also available are crosses of various sizes, but just let us know what you think fitting and we will try to make it. Funeral Cross this full length tribute consists of wild roses and greenery with a cross of Daisies. Any combination of flowers and shapes may be chosen. This Beautiful Heart shaped floral tribute consists of 80 red Roses intricately woven. Also available in a smaller arrangement or in other shapes with other flowers. This elegant cross is made of Lilies and Carnations and is over a metre in length. Also available in different sizes and with various flowers. A standard wreath is usually from 25 Euros up to 100 Euros. We also do the traditional spray of flowers in cellophane with a purple band. Please remember that your flowers will not last very long in the Cyprus sun. It is usual under these circumstances that in the shock of the situation, a loved one may spend more than is necessary, we do not encourage this. We know from our own experience that grief may try to express itself by spending money that one can ill afford. If you wish to leave a lasting tribute at a loved ones grave we can help organise a memorial stone or a stone urn, an engraving or similar that will stand the test of time. Even though we are in the flower business, we do not wish anyone to spend more than can easily be covered on such a transient thing as flowers. Maybe a small tree or annual plant would be more appropriate in the long run. Please speak to one of our advisors to check out your options. If you have any personal preferences, please name them and we will see if we can obtain them, whatever they are..
Do you have ancestral or family graves in Cyprus? Are you unable to visit as often as you'd like to place flowers. Put your mind at ease and let us take care of the maintenance of them for you. Very reasonable rates and a caring, respectful, professional service guaranteed. Maintenance visits can be arranged as often as you require, ranging from a once yearly maintenance visit right up to a weekly visit complete with fresh flowers, or artificial floral signs, wreaths etc, since they are longer lasting and more cost effective to you.